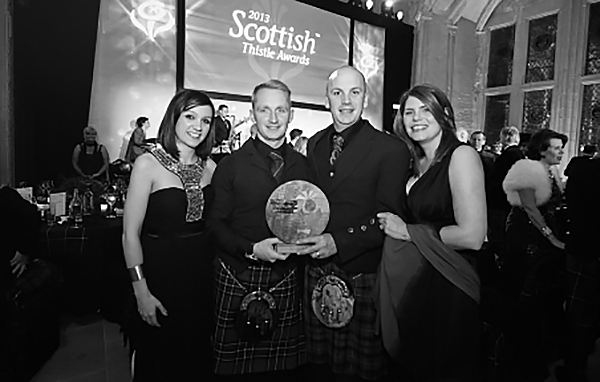 Tiree Music Festival picked up its third award of the year at the recent prestigious Thistle Awards. At a stunning awards’ ceremony held in Stirling Castle, TMF collected the award for ‘Best Cultural Event’, beating off stiff competition from major events such as the Glasgow Film Festival. This award follows on from the regional award at the Highlands & Islands Tourism Awards in October while TMF also retained the award of ‘Best Small Festival’ in Scotland at the Scottish Event Awards in September. TMF has rapidly grown in the space of a few years to become Scotland’s best kept secret on the summer festival scene, however that secret could now be out due to the trio of awards collected in 2013. TMF has created a huge economic boost to the island of Tiree. An independent report by MKA Economics estimated that the festival had generated £493,197 for the local region with 76% of the 1500 attendees travelling from outwith the region to enjoy the festival held on the island dubbed the ‘Hawaii of the North’. Planning is already under way for TMF2014 – the first three day event in the festival’s history and will be held from the 18th–20th July. Before that, there is the possibility of a fourth award of 2013 for TMF as the festival is shortlisted for ‘Event of the Year’ at the Scots Trad Music Awards, held on the 7th December in Aberdeen.